The 7 string guitar is an incredibly versatile instrument. The extended range and extra string open up a lot of ways of playing. If you’re making the jump to a 7 string guitar from a regular 6 string guitar, you might be wondering what to do with it. The songs in this guide show different ways you can use a seven-string guitar. Some of the songs are easy, while others will be challenging. Check out these 7 string songs to learn and give as many of them a go as you can. Figuring out what you don’t like to play is just as important as figuring out what you do like to play, so even if one of these songs doesn’t interest you at first, try learning it anyway. You can use the techniques and ideas in your own music later on. 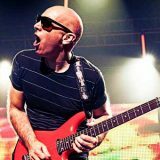 There are countless 7 string songs out there, but here are some interesting examples across different styles of playing and different levels of technicality. If you’re just getting started, check out these 7 string guitar exercises to help you get used to the extended range. If you’re thinking about getting a 7 string guitar, check out some of the best 7 string guitars here. Steve Vai played a huge role in bringing the seven-string guitar into popularity. The Ibanez Universe he designed is still popular over 25 years after it first released. Many of the seven-string players in this list were influenced in some way by Steve Vai (even Korn). There are quite a lot of seven string songs by Steve Vai, but one definitely worth checking out is Weeping China Doll on his Story of Light album. Weeping China Doll is a great example of how to use the seven-string guitar in a melodic way. The song opens with the main melody played in the lowest position as shown in the TAB below. It uses standard 7 string tuning (BEADGBE). If you’re wondering how to play the chord in bar 8, use your thumb to play the first fret on the low 7th string. If you can’t stretch your hand to play all of the notes, leave out the high B string. The entire song is a great showcase of how to use a 7 string guitar in a melodic way, but this is such a killer intro it’s worth learning. 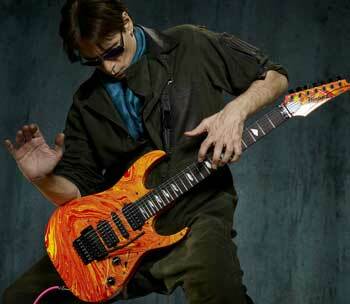 If you want to learn more about Steve Vai’s gear and tones, check out this guide. If you like his style of playing and want to learn more, check out this guide for some more tips. 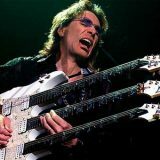 While Steve Vai regularly uses a seven-string guitar in his music, there are only a few seven-string Satch songs. Joe uses a seven-string guitar in a basic way. He plays low riffs or powerchords on the seven-string, then plays his typical lead over the top of it. In a song like Hands in the Air, you could easily play those rhythm parts on a 6 string guitar with the low E tuned down to B. So while Joe doesn’t really push things into new directions with his use of seven string guitars, his songs are an easy way for guitarists to smoothly transition to using a 7 string. Out of all his seven-string songs, Searching has the most interesting riff (in my opinion). If you have a looper pedal, record the below part and practice improvising over the top of it. If you have a whammy pedal, try playing the whammy lick as it’s one of the most interesting examples of a whammy pedal in action. 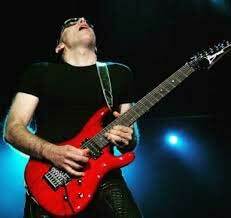 Learn more about Joe Satriani’s gear, effects, and tone in this guide here. For guitarists looking for easy seven string songs, the rhythm parts in the above songs are simple to play. Some of the lead parts may challenge you (depending on your skill level), everybody should be able to play the rhythm parts. John Petrucci regularly brings out the seven-string so you can find plenty of songs to work on if you’re up for a challenge. Odd time signatures, complex riffing, and fast alternate picking can be found in most Dream Theater songs. The clean intro to A Change of Seasons is easy to play and sounds great. Most of the songs in this guide use distorted guitars, so this clean part is a nice change of pace. There’s plenty of heavy and distorted guitar parts if this type of playing is too soft for you. Songs like The Glass Prison and Bridges in the Sky are filled with interesting 7 string riffs. 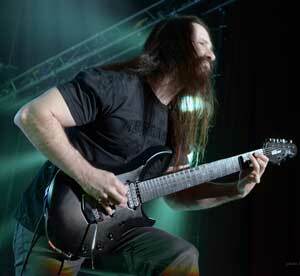 It’s also worth checking out Jaws of Life on John Petrucci’s solo album for some more 7 string inspiration. 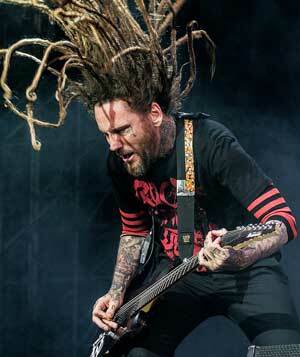 If you’re looking for some easy seven-string songs to learn, Korn is a good place to start. A lot of their songs are based on very simple riffs, which is a great way to get comfortable with the extended range. Songs like Freak on a Leash and Falling Away From Me are great to check out because they makes full use of the entire range of the guitar. It uses the low open string for heavy riffs and chords but also plays gentle melodies in the upper register. Listen to how the two guitars work together with different parts rather than both guitarists playing the same things. Blind is a nice and easy song to learn and will get you used to the feel of a wide seven string guitar. The two parts played below can easily be played on one guitar, so it’s a good way to practice jumping around the fretboard. Korn tune their seven-string guitars down a whole tone to A D G C F A D.
What makes Korn interesting is the way they tend to play single note riffs on the low strings instead of typical power chord based riffs. Here to Stay is a great example of this. If you try to play the opening riff using power chords instead of single notes (as many covers on YouTube do), it loses punch and definition. 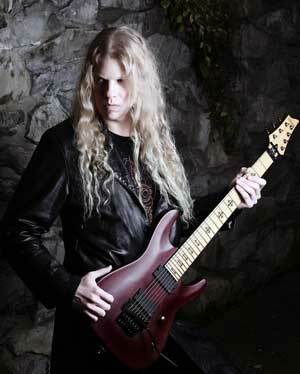 Jeff Loomis is an intense guitarist. He was inspired to switch to 7 string guitars after hearing Meshuggah’s use of them and how it shaped their low-end tone. His signature Schecter is instantly recognizable to 7 string guitarists and is great fun to play if you get a chance to try one out. Jato Unit is a frantic song that makes great use of the 7 string’s low and thick tone. Jeff tunes his 7 string down a half-step to Bb (Bb Eb Ab Db Gb Bb Eb). 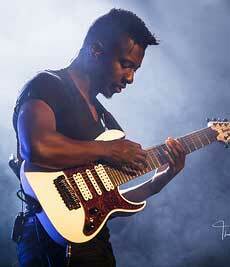 Animals as Leaders are well known for their use of extended range instruments. Most of their songs use an 8 string guitar, but CAFO uses a 7 string. It’s a great way to check out Tosin Abasi’s style of playing without needing to get an 8 string. Tosin makes full use of his extended range guitars, so if you try to play any Animals as Leaders songs written for an 8 string, you’re probably going to get stuck at some point. From a technical point of view, this song is insane. It features lightning fast sweep picking, two hand tapping, and complex rhythms. If you’re not comfortable with sweep picking, the clean tapping section below might be a better place to start. CAFO is tuned to BDADGBE (think of it as a Drop-D with a low B on the 7th string). While the below TAB may look confusing, remember that everything is tapped. Put the pick down and focus on the pattern each hand follows. Try to ignore the bar lines and think about how the overall pattern repeats. If you feel stuck, print out the below TAB and circle each repeating pattern. Make sure each tapped note rings out clearly so when you bring up the tempo you get a nice flow of crisp notes. Even if you know this song is way above your skill level, it’s worth checking the song out. Animals as Leaders is a great example of how you can take music in different directions. I’m not sure of other Animals as Leaders songs that can be played on a 7 string guitar. Tempting Time looks like it can be played on a 7 string so there are probably others as well. If you know of others, please let me know here so I can include them here. 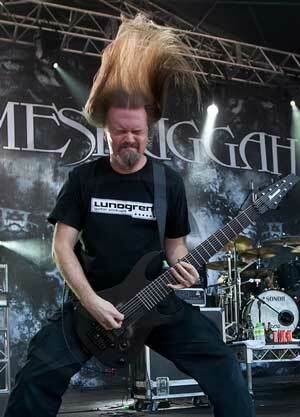 If you want to try out some complex rhythmic patterns, Meshuggah is king. Their earlier albums made use of 7 strings before they started playing on 8 string guitars. Everything before their Nothing album used a 7 string, so there’s plenty of material to check out. 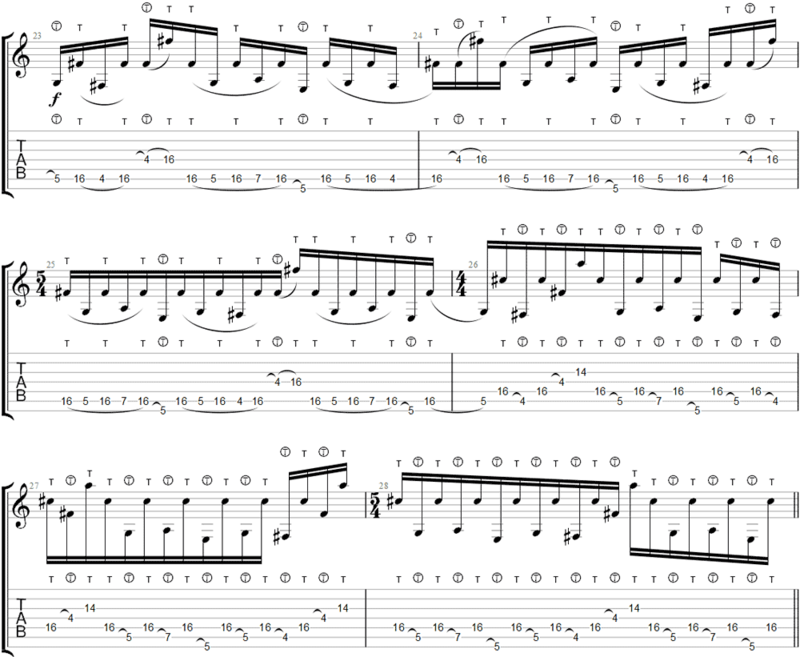 When playing this riff, aim to work on your timing more than anything else. Meshuggah’s tight rhythm is what makes them sound so good. Sloppy muting or imprecise timing can turn something interesting into a mushy mess. This song is tuned down a half-step to Bb (Bb Eb Ab Db Gb Bb Eb). 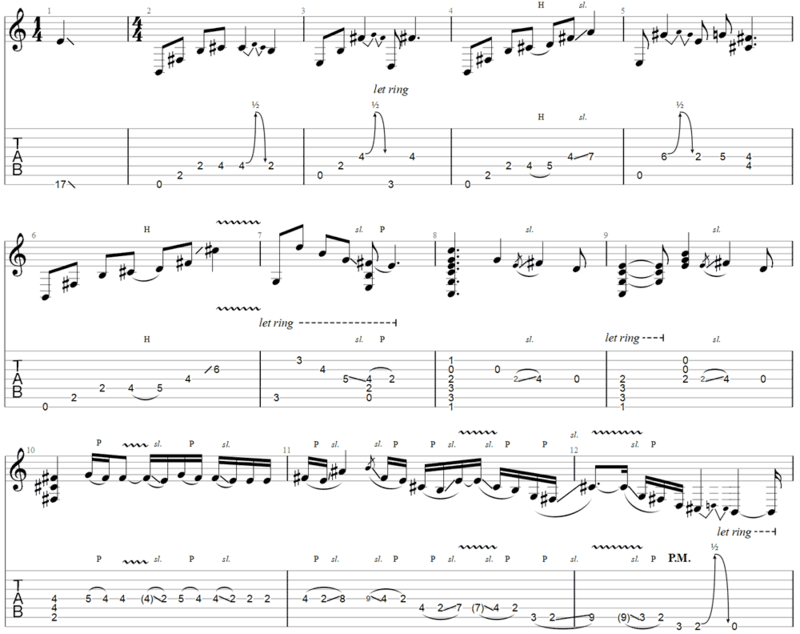 If you feel the below part is too intense, check out the awesome clean guitar section in the middle of the song. Clean arpeggios sound great on a 7 string and the rhythm is a straight-forward eighth note pattern. 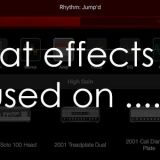 Use a metronome to gradually bring the tempo up and get a feel for the percussive playing style. Unusual rhythms like this start off awkward, but with enough practice, you’ll find your groove. If you don’t have a 7 string guitar yet, you can still practice a lot of their riffs by detuning your 6 string guitar. Remember that Meshuggah moved to 8 string guitars in their Nothing album, so any previous work should be playable on a 7 string guitar. Know any great 7 string songs that really showcase the potential of extended range instruments? Let me know here and tell me why you think it’s a song worth adding to this list.